Ptolemaic Dynasty, Circa 3rd century B.C. As the final dynastic rulers of Ancient Egypt, the Ptolemaic Dynasty were a successive royal family hailing from Greek Macedon who controlled the throne for 275 years during the height of the Hellenistic era between 305 and 30 BC. Ptolemy I was one of Alexander the Great’s seven personal bodyguards who was appointed the governor of Egypt after his death, eventually declaring himself sole ruler. The Egyptians accepted Ptolemy’s rule due to his keenness to appropriate Egyptian culture and his family ruled Egypt until its final Roman conquest in 30 BC. First appearing in the early Middle Kingdom circa. 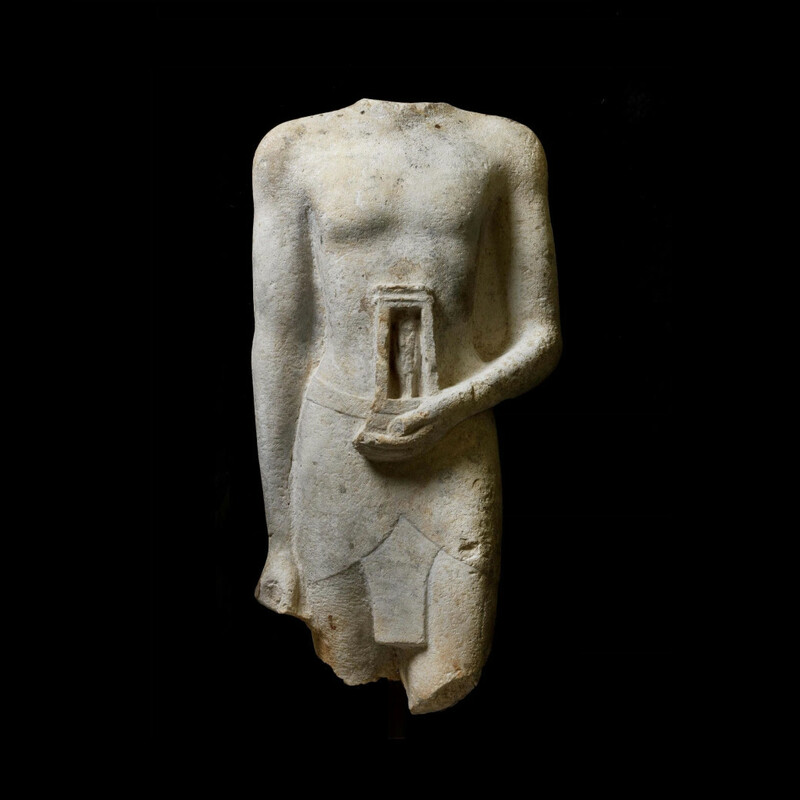 2000 B.C, naophorous statues of kneeling or standing priests and worshippers made from greywacke, wood, bronze, alabaster, granite, basalt, diorite, quartzite and limestone, such as this fie example, were common throughout Ptolemaic Egypt. Depicting exclusively men, they acted as an anthropomorphic bridge to elucidate dialogue between man and god. The etymology of the word naophorous can be traced back to the Ancient Greek ‘naos’ meaning ‘shrine’, referring to the box held on extended arms as a spiritual offering by the dedicatee. The box would typically contain a religious idol, often the god of the underworld, Osiris. The presenting motion with which the box is held emphasises the protective nature of the gesture – whoever holds the naos is asking for reciprocal protection from its inhabitant cult divinity, possibly associated with certain temple rituals or festival processions accordingly. This figure defiantly stands with one foot forward in a momentary walk, resembling Archaic Greek Kourai statuary. He wears a simple three-piece shendyt, free from design or pleats in a Hellenised tradition. His right arm extends down the length of his torso culminating in a clenched fist, while the left hand holds the naos shrine at navel height, with a recessed niche holding the cult statue as it is proudly presented it to the gods in a gesture mimicking the hieroglyphic sign for ‘embracing’. The subtly delineated musculature and smooth surface of this male exhibits the skill of a sculptor well-versed in human anatomy, and speaks of a Hellenised ideal view of the human form; superfluous details have been avoided in favour of a stylised archetype. On the reverse of this life-size limestone statue is a panel running the entire length of the body, providing a space for the carving of hieroglyphics which was never completed, suggesting that this statue was originally to be placed with tis back against a wall perhaps and had an inscribed pedestal. This important and exquisite statue has been exhibited in the Antikenmuseum in Basel in Switzerland, as an outstanding example of Ptolemaic Naophorous statuary. A smaller limestone Ptolemaic Naophorous exists in the British Museum collections in London, with its feet and head missing. The reverse shows three lines in inscribed hieroglyphic text, much as this would appear had it been carved. The static nature of the British Museum example highlights the superb craftsmanship of this example, with its careful modelling and harmonious equilibrium, while also providing evidence for their popularity as crucial tools used to make contact with the gods. J. Josphsun, M.M. Eldamaty; Statues of the XXV and XXVI dynasties, American University in Cairo Press, 1999. P.6. E. Brovarski, D.P. Silverman; Searching for Ancient Egypt: Art, Architecture and Artifacts from the University of Pennsylvania Museum of Archaeology and anthropology, Cornell University Press, 1997. P.121. J. Osing, E.K. Nielsen; The Heritage of Ancient Egypt: Studies in Honour of Erik Iversen, Musuem Tusculanum Press, 1992. P.47. Limestone Egyptian Ptolemaic naophorous, British Museum, London, 69 cm high. EA92.92. Previously in a Private European Collection since the 1960’s. Private Japanese Collection kept in Switzerland until 2014. A. Wiese, Ägyptische Kunst im Antikenmuseum Basel und Sammlung Ludwig. Neue Leihgaben, Schenkungen und Erwerbungen, Basel. 1998. p. 81, no. 101.